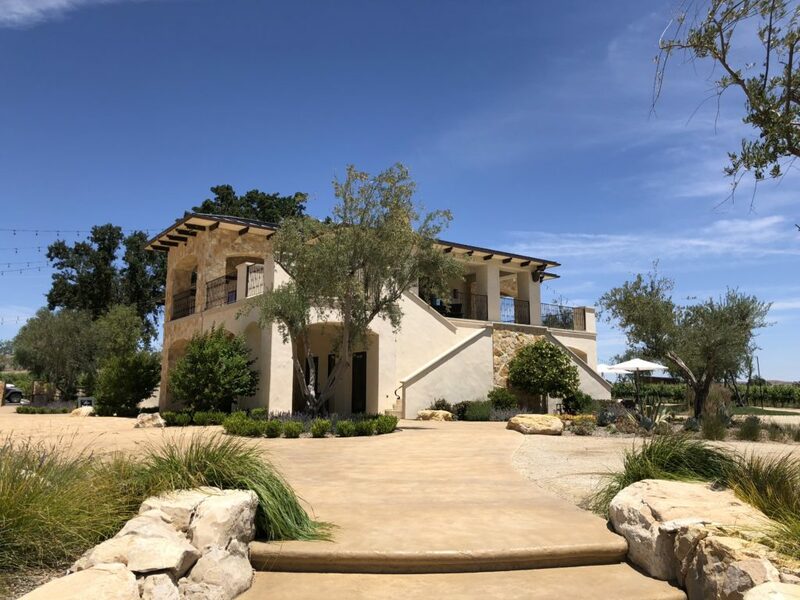 We recently heard a few people mention Rava Wines so we decided to pack a picnic and Sammy and head out Creston Road to check this place out. As you pull off of Creston Road you drive down a lengthy driveway lined on both sides with vineyards. Once you reach the parking lot you notice the landscaping, large grassy area, and the beautiful tasting room building. You can scroll down and check out the slideshow of photos to check it out. It really is a wine oasis. A great place for events, picnics, and whatever else you crazy kids want to do. The tasting room is awesome and it opens out on to a covered sitting area and all the landscaping I mentioned above. And when it comes to wine, their menu is sure to have something on it to please everyone. Get this, they have several sparkling wines, white wines, a Rose, and of course, reds. What better way to start your day than sparkling wine, right? Jody poured for us and we had great conversation as she filled us in on Rava and their wines. The winemaker, John Clark, also has his own label with his wife called Brophy Clark Cellars which can also be tasted at Rava. You can see photos of their wine tasting menu below as well. We really enjoyed the sparklings, the Albarino, Chardonnay, the Rose, Pinot Noir, and their GSM. Once the tasting was over we grabbed a bottle and set up our little picnic outside at one of the many tables and proceeded to enjoy our two-hour stay. Sammy had a blast too. The day we were there they had doughnuts so he got his sugar high on. Apparently, the frosting was made using their Grenache Rose and they were made by SLO Donut Co. Good times. No joke, this is seriously a place you should check out. Take some snacks and enjoy the beauty that is Paso Robles wine country. They’ve put something quite special together out there. You can check out their website here and also learn more about their winemaker and his label, Brophy Clark, here. Thank you again to Jody for taking excellent care of us!